Chaos. War. Anxiety. These are just a few words that might describe the topic. There has not been a bigger wave of refugees since World War 2 as we, in Switzerland, are experiencing it at the moment. People ,especially from the Middle East, are pioneering their way all over European countries. But the real question is: Where can we place the victims? Do we have the needed resources to handle the situation? The Swiss officials are pretty conservative and blinded by prejudice at the same time. Sure, when I am leaving the train station and travelling to work, I might get somewhat angry when I see a bunch of refugees sitting at the lake and drinking beer the whole day., but I push my thoughts immediately out of my mind. I cannot put every refugee under the same umbrella. There are lots of people that had a real reason to leave their homes, caused by war or being a victim of political persecution, but there are others that enjoy their lives paid from Swiss citizens’ taxes and even commit crimes. Identifying the difference between these two groups of people is the main dilemma. In Lucerne, where I live, there are lots of refugees. I worked for the Swiss bank called PostFinance. A couple of years ago, the bank used to be in the full possession of the state. Since 2014, PostFinance became independent from the Swiss government. They now have almost every license as a general bank, but PostFinance still needs to follow some regulations from Switzerland. For instance, it is a written law that everyone in Switzerland with a resident permit must have access to financial services. PostFinance is the only bank who opens accounts and makes consultations with the refugees. In these consultations, one can see the difference between the grateful and ungrateful refugees all of whom receive free financial services. There is a group of young Eritrean activists who want to prove the condemning Swiss citizen wrong. According to the public relations speaker of the group, the dilemma is caused by the very few possibilities for refugees to integrate well in our society. Without a diploma and perfect Swiss and English language skills, the immigrants are not valuable on the job market. That causes lots of problems for refugees, because it is almost impossible to attend school and achieve the required skills. In conclusion, the refugees get the feeling of not being an active participant of society and often become depressed. Instead of staying at home, they try to kill time and make friends with other people of the same origin. As a result of a failed integration, the refugees meet with their friends in public places, cut out of the world and society. There is one feeling that is spreading more and more in the parliament chamber: Doubt. 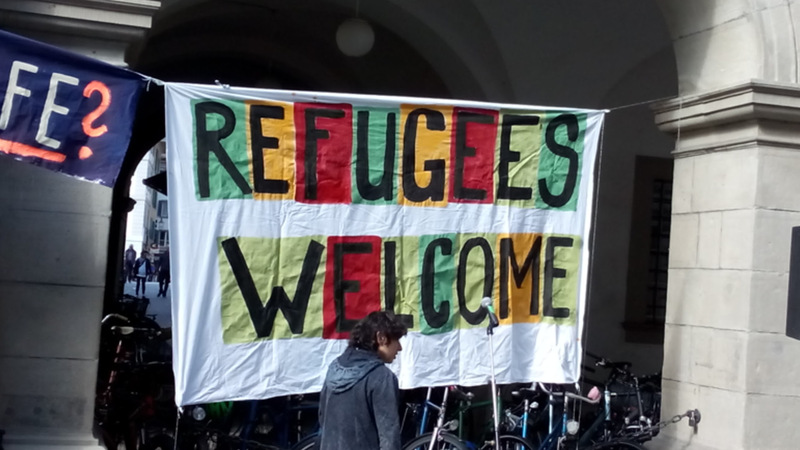 While the liberal political groups still try to convince the Swiss citizens to help the immigrants to be active and a part of the society, the conservative political groups use blatant propaganda to destroy the reputation of all refugees. To sum up the situation: people are anxious and curious about what is going to happen in the future.